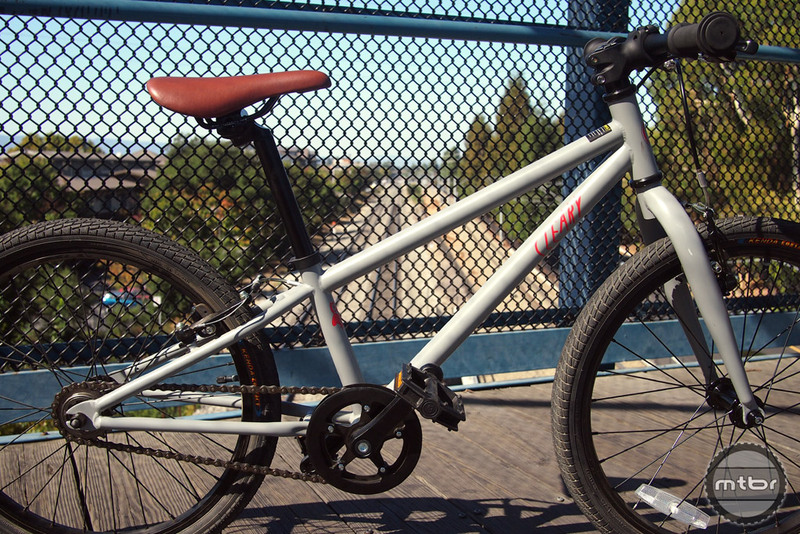 Lightweight and simple singlespeed offers miles of smiles for young riders. 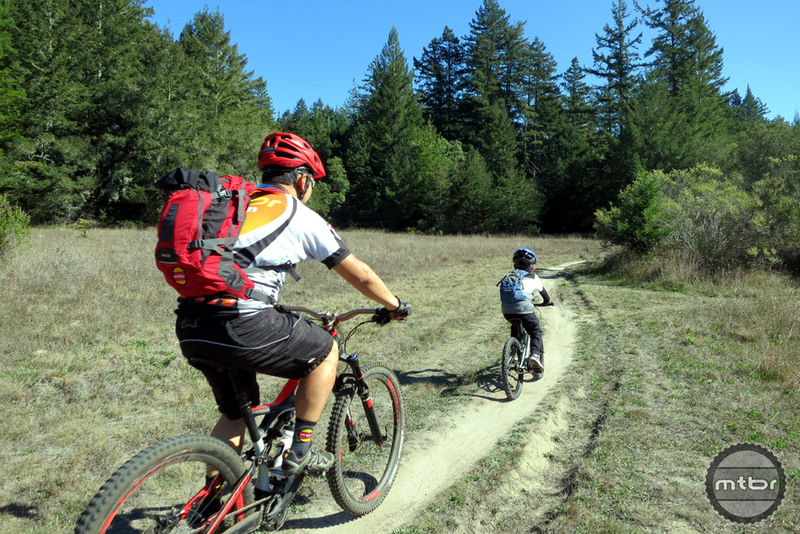 Cleary Bikes is a new company located in Mill Valley just a stone’s throw from Mount Tam, the birthplace of mountain biking. The company is the namesake of Jeff Cleary, who is a former triathlete and mountain bike racer who raced singlespeeds for Soulcraft for many years. 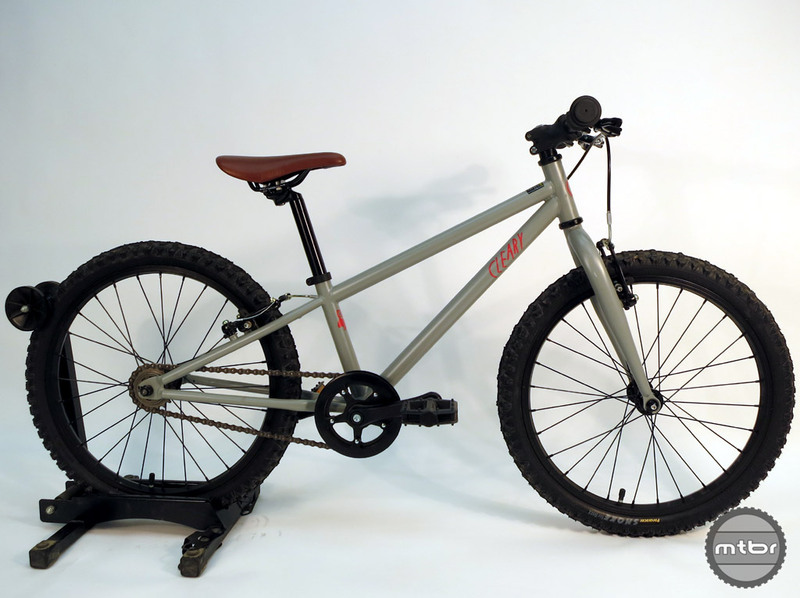 It all started with an idea about 2 years ago when Jeff decided to quit his job as a litigation lawyer and take his passion for mountain biking and blend that with his desire to make a fun, simple bike for his own kids. Jeff (on the left) and his business partner, Dave were manning the Cleary Bikes booth at Interbike. They are holding up the 16″ Cleary Hedgehog in Very Orange. 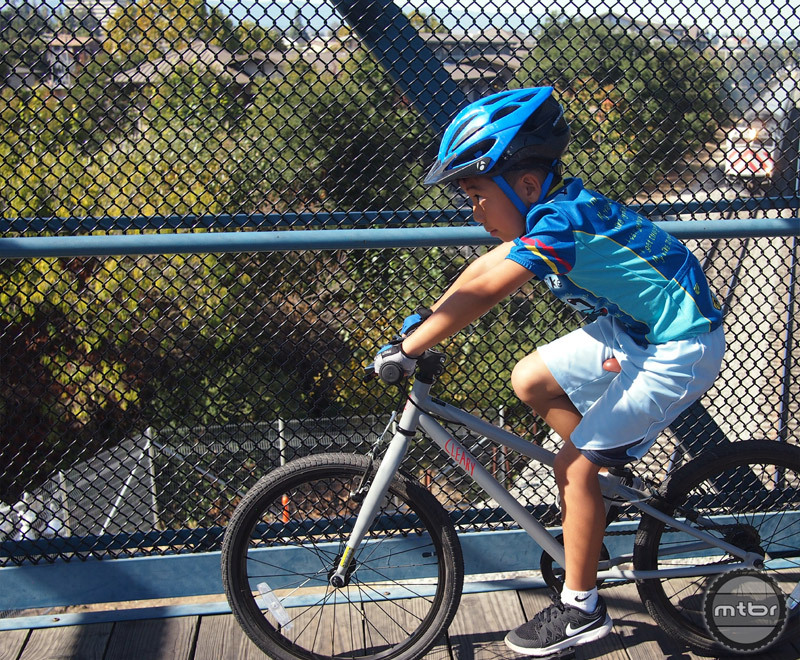 With the help and encouragement of his friends, Cleary Bikes now offers four models of kid’s mountain bikes. The models are the Starfish (12″ balance bike), the Gecko (12″ singlespeed), the Hedgehog (16″ singlespeed) and the Owl (20″ singlespeed) which is the one featured and tested here. 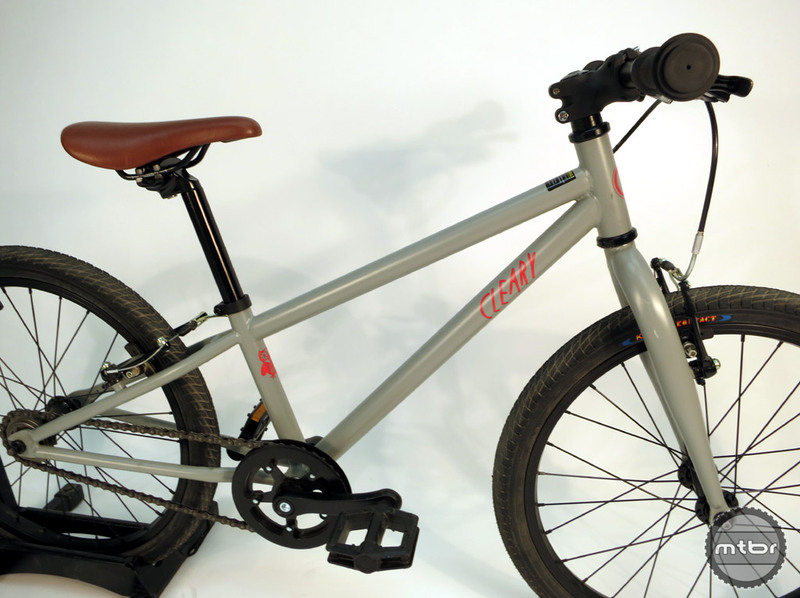 All the bikes are made from steel and provide a lightweight alternative to many of the other kid’s bikes on the market. 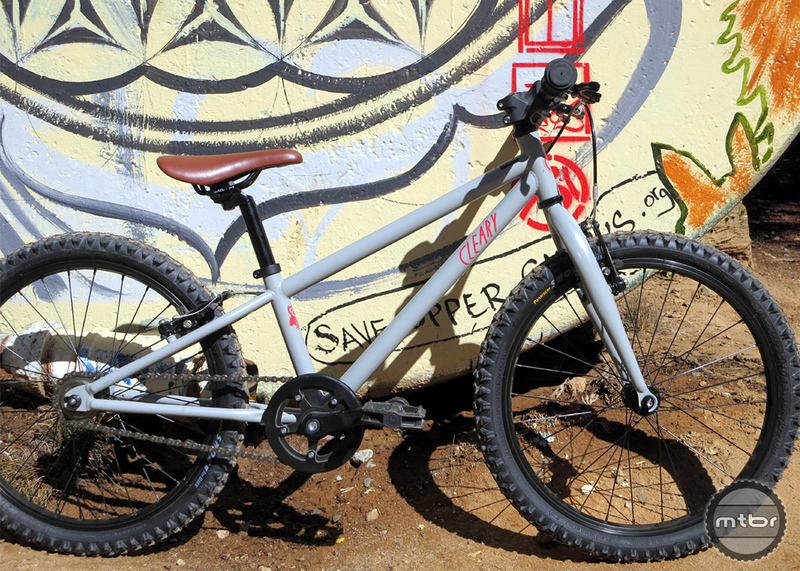 The MSRP of the Owl is $325 which is right in the ball park for an up-spec kid’s bike. The next biggest improvement is the Tektro V-brakes, which provided much more stopping power that the rider’s old bike. 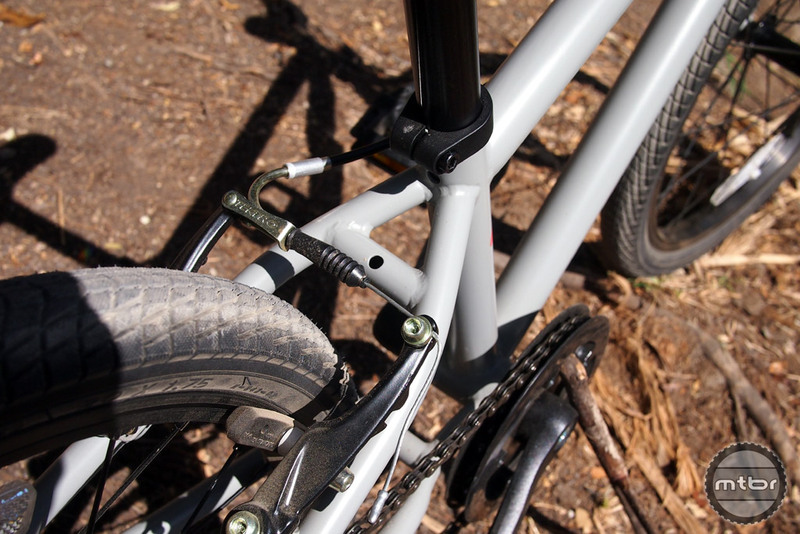 The frame itself is solid with clean welds, a low standover height and it even has internal cable routing! Cleary pays attention to the details and the grips, handlebars and brake levers are all specifically designed for small hands to help improve rider control (and thus confidence). 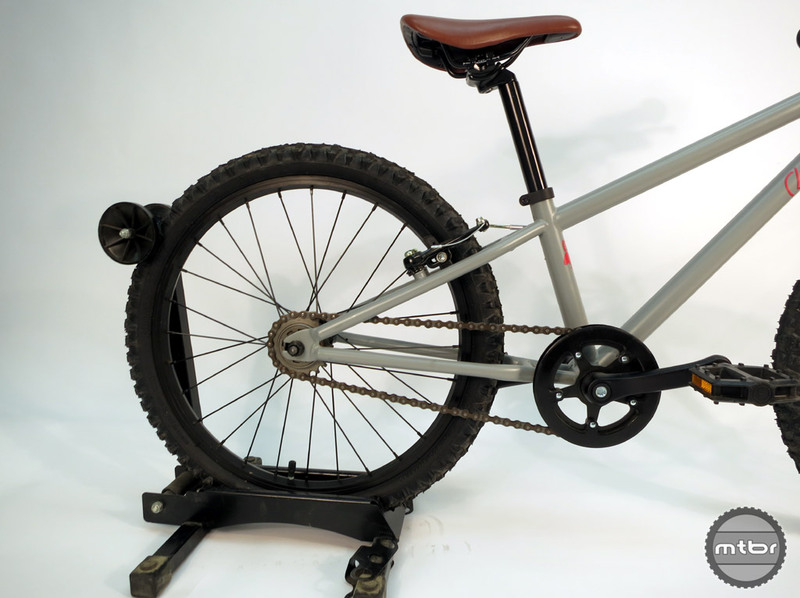 The singlespeed design means the drivetrain is kept simple and easy. This works for paved paths and biking to school, but it could be a limiting factor if your little one is ready to tackle some real hills. 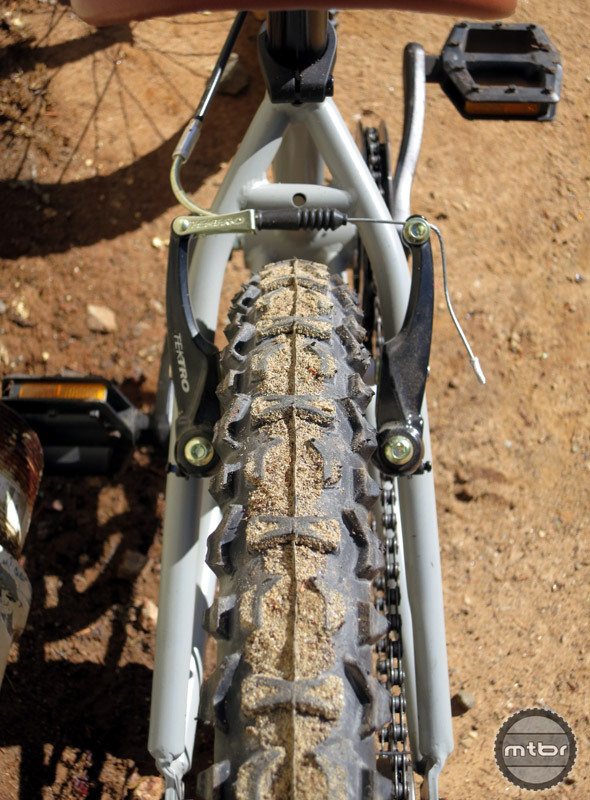 The 32×19 drivetrain works well for many conditions and is a good “all-around” gear. 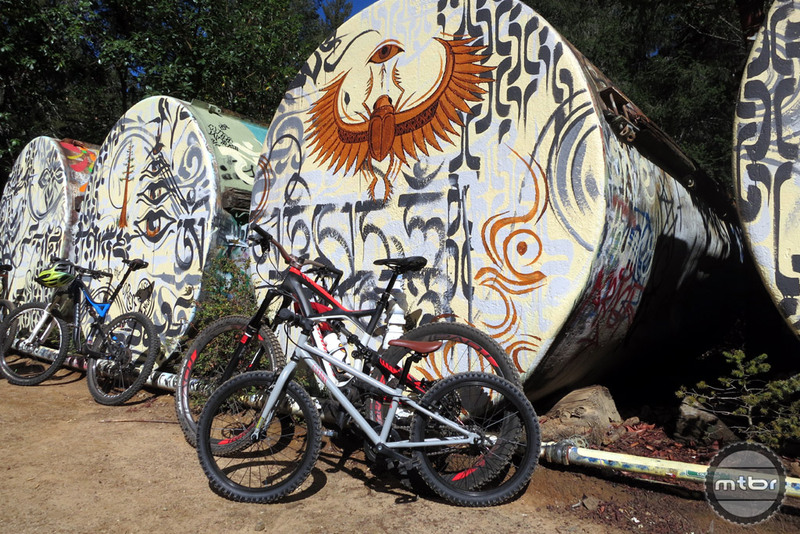 The geometry of the Owl is decidedly more “mountain biker-ish” than most kid’s bikes out there. What this means is that the handlebars are lower than the usual sit-up and pedal position. 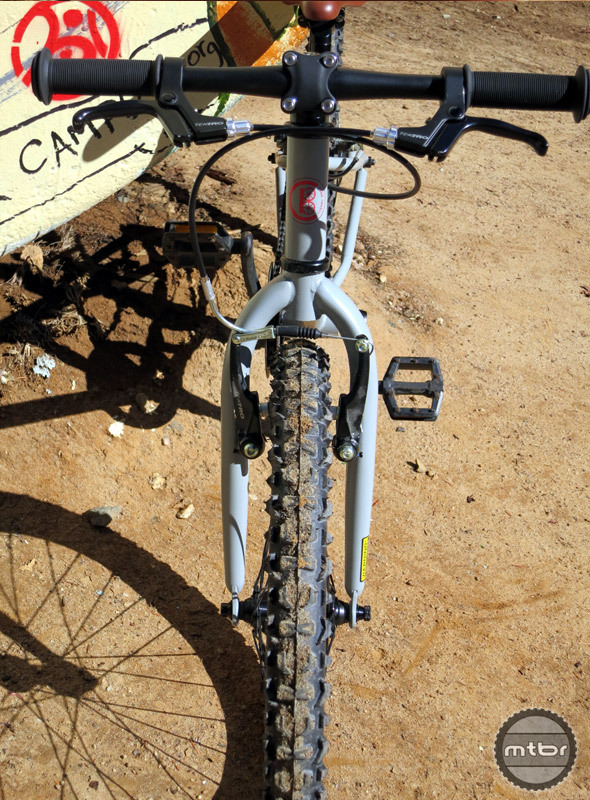 By lowering the bars, the rider’s weight is centered more forward – between their hands and the seat. This creates a quicker handling position. The one part of the cockpit that we would like to see improved is the width of the handlebars. At 16″, the bars are a bit too narrow for when the speeds go up and the need for a bit more leverage increases. The Owl comes with Kenda Kontact tires which worked well for paved paths, streets and flat dirt trails. But, they were the first thing we switched when it came time to hit the real trails. We found a set of Panaracer Smoke tires (remember them?) at our local bike shop and threw them on. Well, we didn’t actually throw them on. We found that the chain on our test bike was on the short side and we didn’t have enough play to remove the rear tire without breaking the chain. We mentioned this to Cleary and they will work to make sure my experience is not the norm for future riders. Once fitted with proper knobbies, we were good to go. Riding on one of the most popular paved trails in the neighborhood. This side view shows the forward weight placement of the rider from the low, flat handlebars. 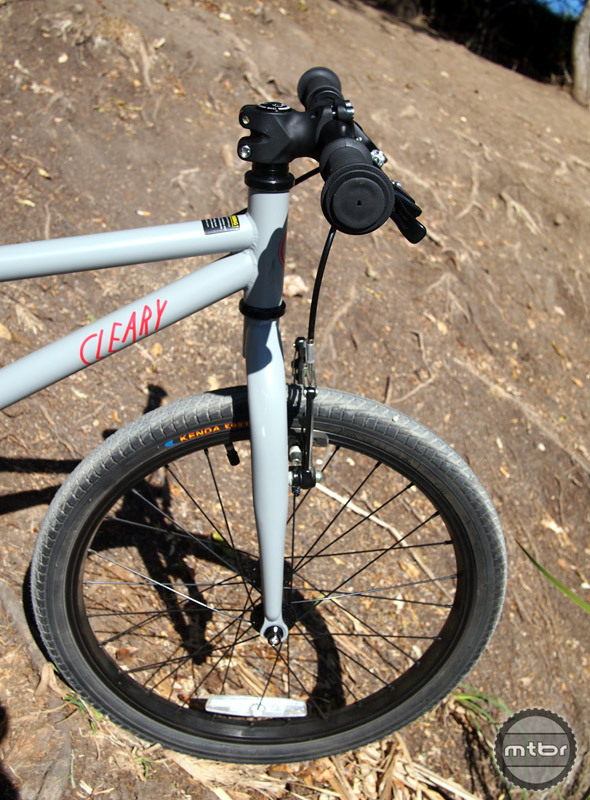 The Cleary Owl was a fun bike to ride and its light weight combined with the ease of use of the singlespeed drivetrain helped our test rider have fun for his first taste of a “real” mountain bike trail. Of course, climbing is limited by the lack of gears, so you will have to choose your routes carefully. The V-brakes worked flawlessly and they help build rider confidence by giving them a secure sense that they can stop well (especially important when they are riding new trails). 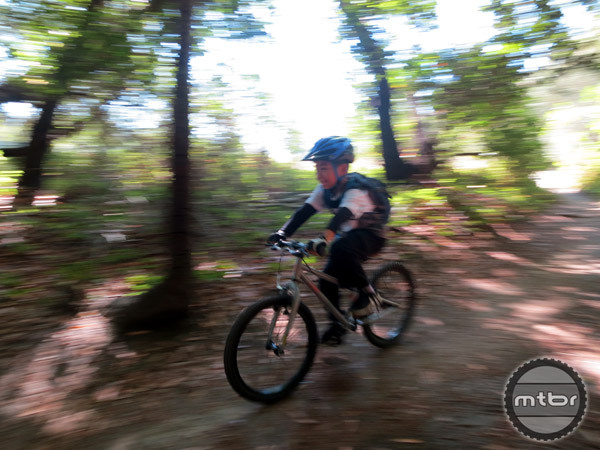 With real dirt knobbies, our little test rider was too fast for our camera on the shady singletrack. 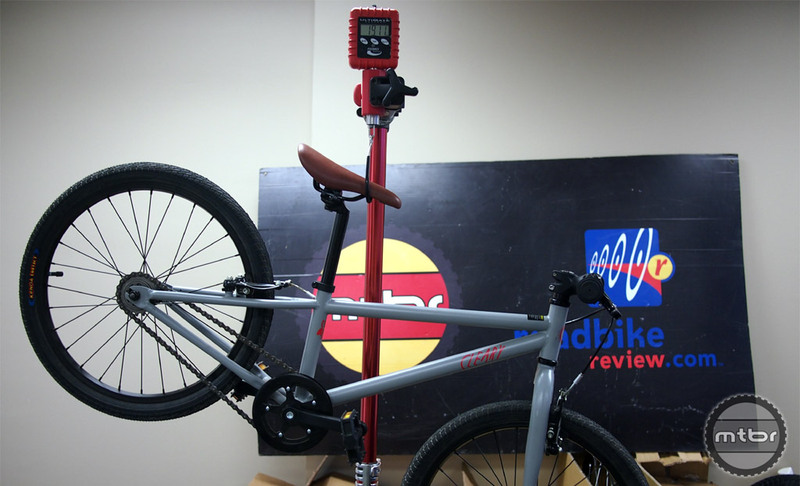 This bicycle brought plenty of smiles to our tester’s face. 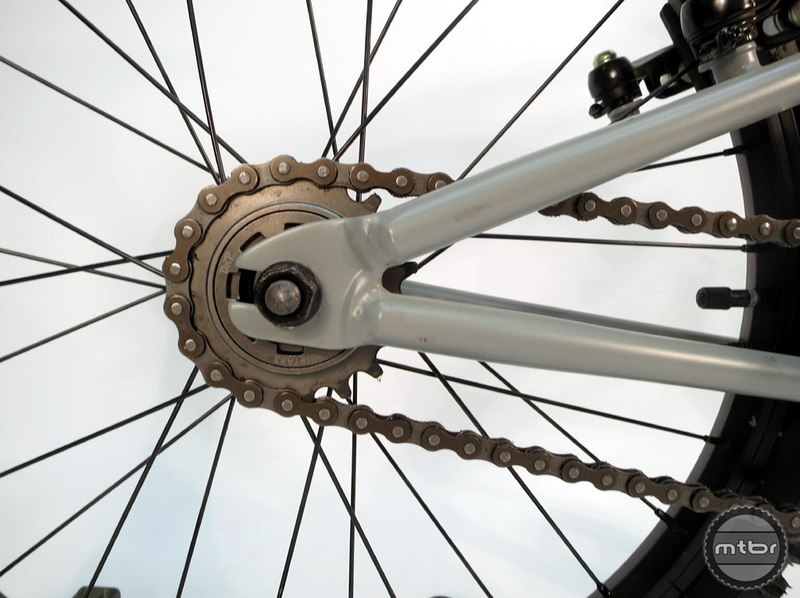 If you are sticking to paved paths or local neighborhood rides, the lack of gears will not be a problem. The Owl is more than up to the task of multi-use path riding. We tested the Owl on many different types of rides and the build quality is solid and strong. We can attest that the bike will hold the weight of an average adult, if you are curious how it rides or just in need of a pixie-bike fix. Ah, the joys of being able to ride real trails with your kids. 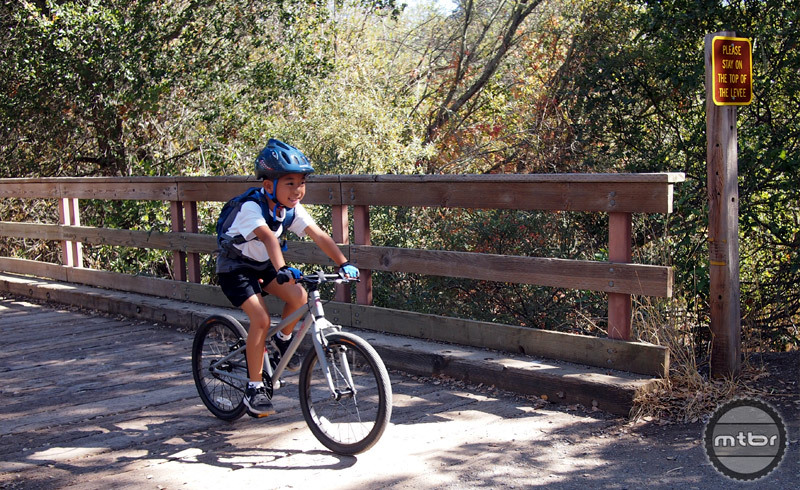 As a mountain biker, almost from the moment we have kids, we wonder how soon we will be able to share our Passion for biking with our little ones. From bike trailers, to on-bike child carriers, to Trail-A-Bikes…I have been riding with my son for many years and it is with much pride and joy that I am now able to share my love of singletrack with him. He has gone through balance bikes, cheap mass market bikes and hand-me-downs and has earned the right to have a decent ride for himself (meaning: he has shown he loves to ride, too and will not give it up and have the bike sit in the garage gathering dust). For those of you out there who are looking to upgrade your son or daughter to a “real” kid’s mountain bike, Cleary Bikes provides an excellent option. 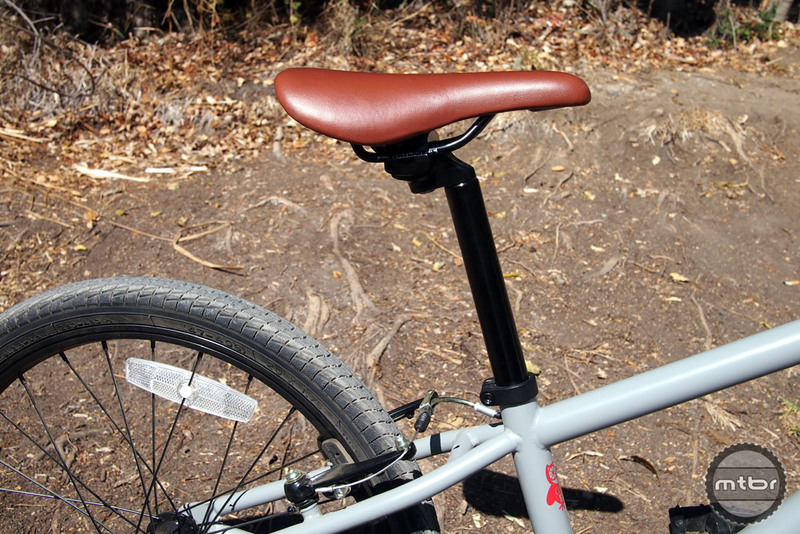 The Cleary Owl features kid’s size handlebar, grips and levers for comfort and ease-of-operation. The Cleary Owl is a very cool little bike that will provide miles of smiles for young riders who are looking for something a bit more serious than the offerings from mass market retailers. This lightweight singlespeed is easy to ride, comes with a more mountain biker-ish stance than the usual kids bike and Tektro V-brakes also give kids better control (thus increasing their confidence). 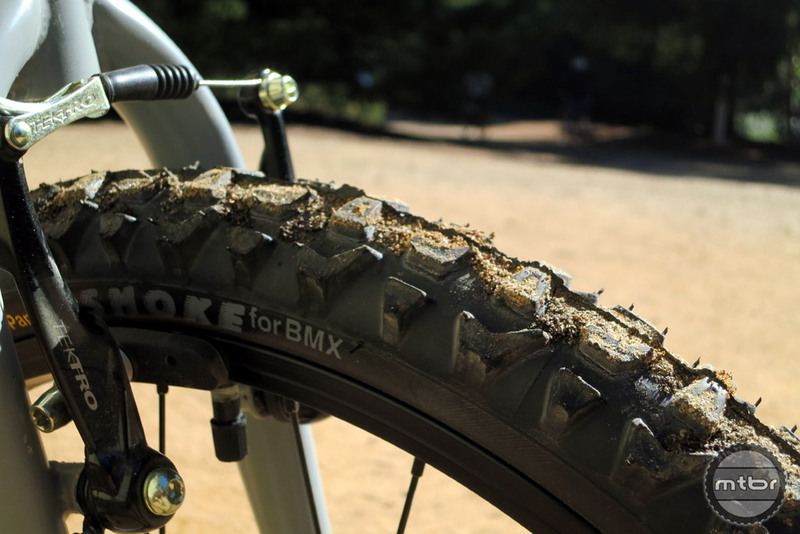 For real dirt trails, you will definitely want to upgrade to true knobby tires. It would be nice to have an option with gears and we have heard rumors of a geared option coming soon (most likely for a new 24″ wheeled bike first, with others to follow depending on the popularity). Cleary Bikes is currently working on building up their dealer network. If you are a bike shop owner, feel free to contact them about becoming a dealer. For now, the Cleary Owl and all of their models can be purchased directly from Cleary Bikes through their website. The Cleary Owl weighs a real 19.1 lbs. The Easy Grey finish on our Owl looked clean and simple. A bit more perspective on the size of the Owl. It is leaning next to a size Medium Specialized Enduro 27.5. Shown with the Panaracer Smoke tire upgrade. Our tester realizes the joy of a good downhill. Single speed keeps it simple. A kid’s bike with internal cable routing? Nice! 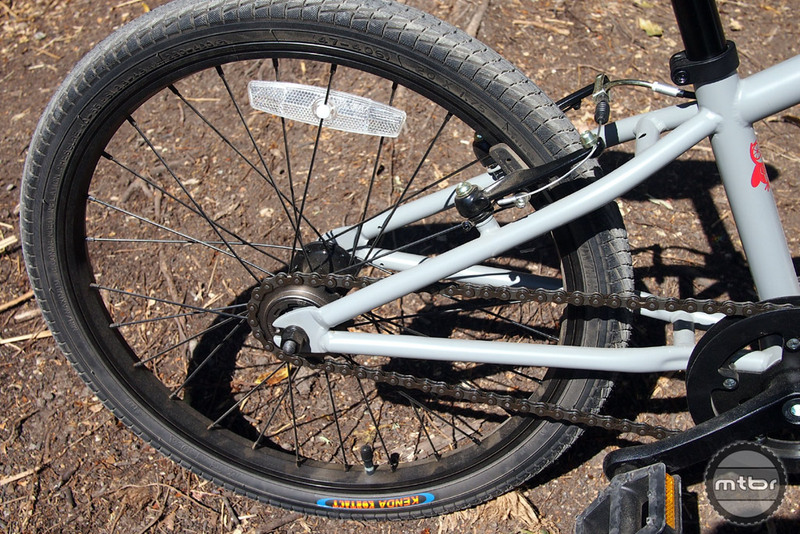 The Panaracer Smoke tires are marked for BMX, but served us well on the mountain. There was more than enough tire clearance for the Panaracer Smoke knobbies. Plenty of front tire clearance on the Cleary Owl. Our little tester literally had miles of smiles on his Cleary Owl. The rigid front fork worked fine. The saddle was on the firm side, which was okay with our little tester. The V-brakes are a real step up from the big box mass market type kids bikes. The 19T cog is matched with a 32T ring and the KMC chain worked fine. 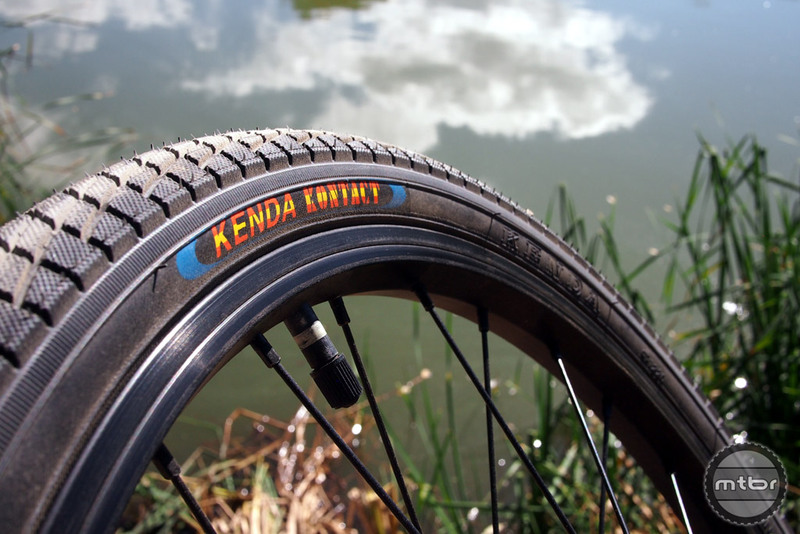 The stock Kenda Kontact tires can handle pavement and light dirt duty. 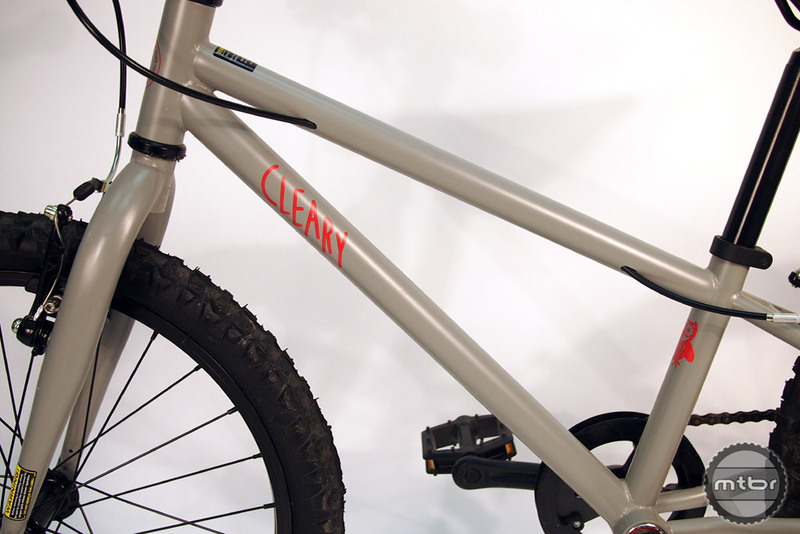 The Cleary Owl is a 20″ kid’s mountain bike. With real dirt knobbies, our little test rider was too fast for our camera on the shady singletrack. On one of the most popular paved trails in the neighborhood. Kid size handlebar, grips and levers. 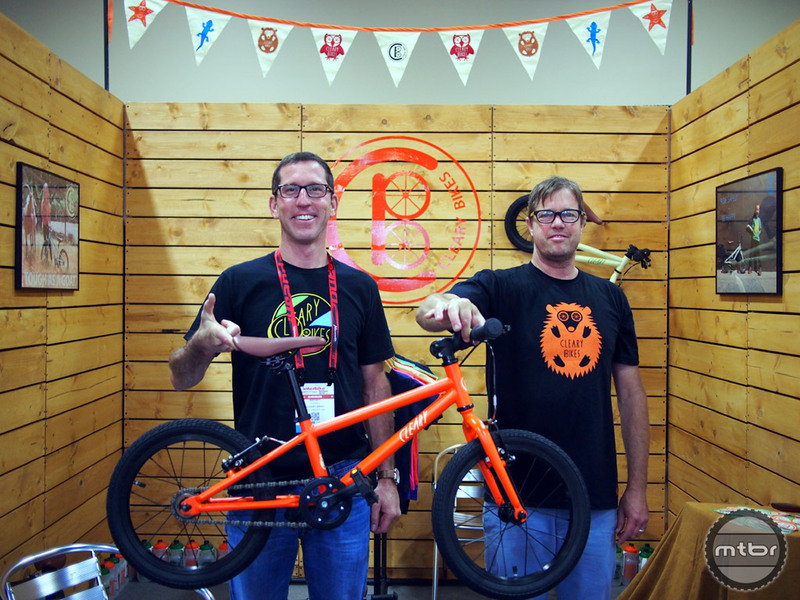 Jeff and Dave were manning the Cleary Bikes booth at Interbike. The joys of being able to ride real trails with your kids. I considered this bike for my below average height 7yo but he really wants gears. Looking at the Trek Superfly 20. Spawn and Commencal are nice but pricey. 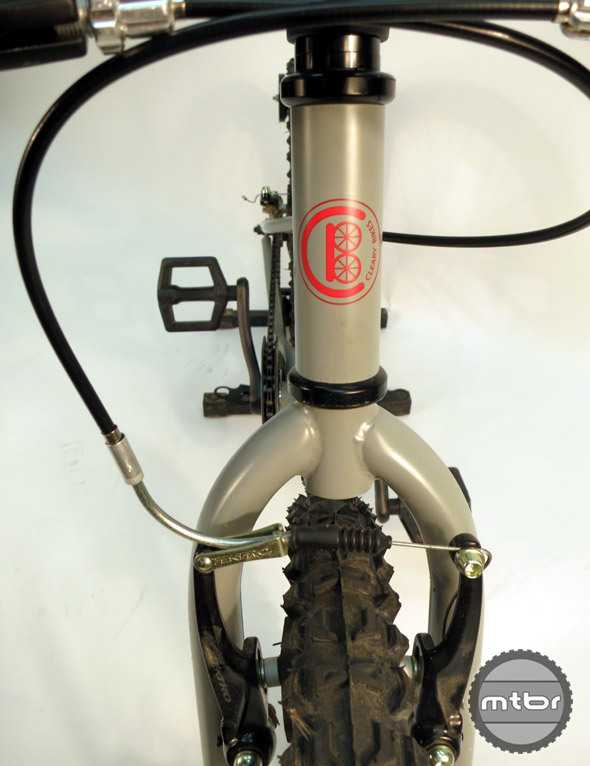 MTBR should do a kids bike compare-o. Hey Gil, a kid’s bike comparison is a good idea. Besides the three you mention there is also the Scott Scale Jr. (and the apparently discontinued Spark Jr. full suspension model), the Kona Shred, the Rocky Mountain Edge and of course the Trek MT series and the ever popular Specialized Hotrock. Lil Shredders are awesome, for sure, but at $2k plus, they are in a whole different price/committment level. On the other end of the spectrum, there are cheaper options from brands like GT, Diamondback, Fuji and others. 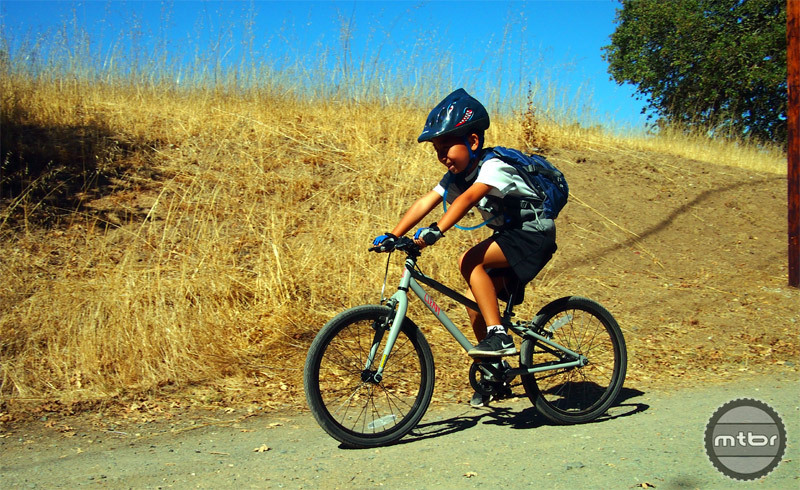 Once you make the move from 20″ wheels to 24″ the options increase (especially for full suspension kid’s mountain bikes). That said, we have a review of another kid’s 20″ mountain bike coming – the Norco Charger 20 with full hydraulic disc brakes, gears (with trigger shifters) and a suspension fork, so stay tuned for that. My kids have the 14″ Furi’s and we will be up grading then to 16″ Banshee’s in the coming summer. This is obviously a beautiful bike, and it’s actually competitively priced with other higher end kids bikes. That said, my son has been growing up on Specialized Hotrocks (12/16/20 and now 24), and I can highly recommend them, especially since they tend to go for $100-120 in mint condition on craigslist. I do love the fact that all the Clearies come with flat bars. I’ve been swapping old low-rise bars onto every one of my son’s bikes. The stock bars tend to be heavy steel ones. Obviously it’s a very well thought out bike and its great to see a company that focuses on this when there are so few good kids MTB options. 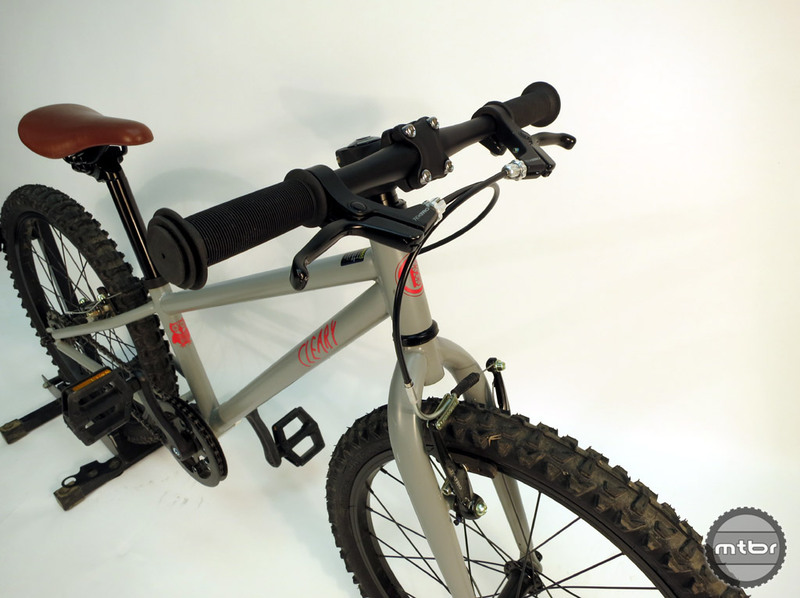 But I would have gone with a simple 1×6 drive train as an option for those who live in hilly areas where even a lightweight bike is a struggle to get uphill for a six or seven year old. Cool to see Kids bike reviews props to Gregg and MTBR, I think a good bike is a must if you want your kids to share the passion and truly enjoy there time. I have gone with used HotRocks for my kids and been extremely happy, my 6 year old is on gears now even, and I looked a clearly when we went to 20″ wheel but decided now was the right time to get on gears. Hotrocks still get a good premium used in my area as well and while worth it if you can find one for 100-120 mint I would not hesitate. We have an isla bike (http://www.islabikes.com/us/bike_pages/beinn20.html), which I think is almost perfect – aluminium frame, and kid-friendly gears, for ~100 USD more than this. Will the stays clear a 16+ tire?